Stop me if I am getting too spiritual, but I really think Siesta Key Beach is God’s answer to paradise on earth. And when I attended the festivities celebrating the two-year, $21.5-million renovation, I was beyond the point of being overwhelmed. Of course, the beach and one parking lot have been open all along, but at last we were privileged to see the finished masterwork. As I entered the original main entrance on Feb. 20, I was greeted by two huge cement signs designed to welcome visitors to Siesta Beach. I walked toward the beach, but if I had been driving, I would have seen the renovated and enlarged parking lot on my right. And next, I saw the stunning refurbished pavilion, which was originally designed by Tim Siebert. Across from the pavilion are the brand-new, spotless bathrooms. Did I mention the weather was a perfect 10-plus? Cloudless azure skies let the blazing yellow sun beat down on us while it also beckoned us to sink our toes into the perfect white quartz sand. I did arrive in time for the welcoming speeches. A huge tent was set up, with many chairs for visitors, and many more of us stood around the exterior of the tent. 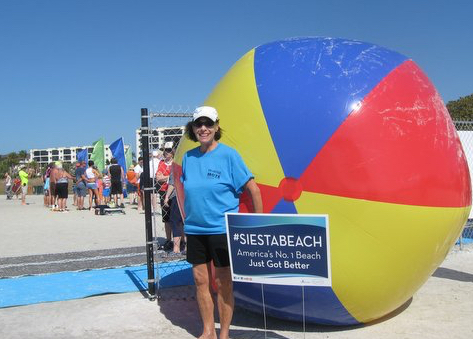 Siesta Key Beach Park volunteers looked so proud, wearing their yellow T-shirts. Working at this event was truly a labor of love. When the speeches ended, suddenly a flash dance appeared, and we were “invaded” by phenomenal dancers from Booker High School. Their exuberance was infectious as they danced to many Beach Boys’ hits. It did not take long for the audience members to jump right in with them. The dancers continued as tables were filled with trays of fruit and pastries, plus coffee: an excellent morning snack. I was curious and eager to see all the improvements up-close and ready to enjoy more of the celebration, so I started walking. Shortly, I passed two enormous red Adirondack beach chairs on either side of the well-known sign proclaiming Siesta Beach No. 1. Just about everybody wanted to sit down and get his or her “selfies” taken. Sinking into the chairs and laughing hysterically were actions accompanied perfectly by the blaring Jimmy Buffett music telling us all about cheeseburgers in paradise. I then followed the designated blue path along the beach, which led to a large tent filled with little girls patiently waiting their turns to have their faces painted. The Sarasota County Government tent did not get much attention. Instead, everyone was focused on three mega-size beach balls next to another No. 1 Beach sign —also a great backdrop for more photos. I walked back to my beach chair and met up with a police officer and her horse. I’m sure most of the children — and many adults, too — had never seen a “police horse” working on a beach. While I was standing next to her, I saw five more Sarasota County Sheriff’s Office deputies just laughing and chatting, not having too much to do except maybe protecting us from an invasion of hungry birds. Another wonderful idea for the celebration was the wall of large black-and-white photographs describing how the renovations finally came to fruition. This will be permanently on display at one of our local Chambers of Commerce. Once again, I experienced one of my most beautiful and memorable days at Siesta Beach.